Early on Saturday morning groups of NRM supporters went around Mbarara town defacing posters of the Go Forward independent candidate Amama Mbabazi ahead of his rally in the town. As the sun rose at dawn illuminating the dark alleys of Mbarara town, what transpired at night became visible as Mbabazi’s posters had been replaced with President Museveni’s posters all over the center of the town. According to footage captured by an NTV cameraman, in some places the defacing of Mbabazi’s posters was done in full view of Uganda police men. When asked to comment on the incident, the Regional Police Commander for Rwizi, Hilary Kulayigye, told NTV that no one had been arrested over the defaced posters and he denied police involvement. 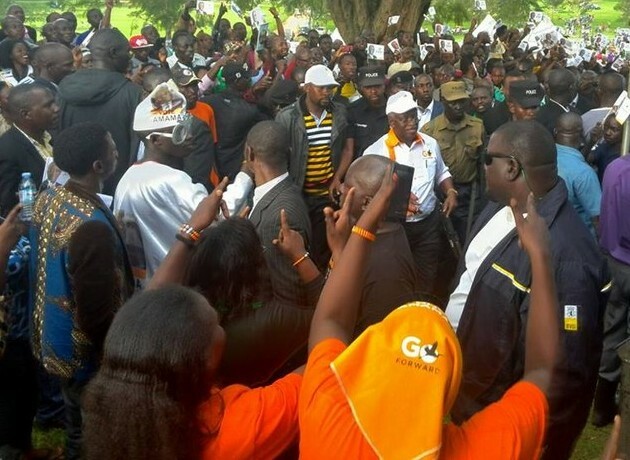 It was later revealed that boda boda cyclists were being paid to stay away from Mbabazi’s rally. Boda-boda cyclists NTV talked to claimed they were promised money and free fuel if they stayed away from Mbabazi’s events. Later on in the day, some boda-boda cyclists confronted an NRM official over what they claim was payment for their services. As Mbabazi’s convoy made its way through the town, another batch of motorcycle cyclists were called to Nyamitanga Resort with a promise of 40,000 Uganda shillings each. Mbabazi later addressed a rally at Boma grounds where he condemned the actions of intimidating his supporters and defacing his posters. Source — NTV News Video.